This section uses words — here, (string, pos) pairs — gathered from a large online collection of informal texts to try to build lexical scales of a sort that could be used for calculating scalar conversational implicatures. We start by figuring out how best to study word distributions, then look at two methods (expected ratings and logistic regression) for assessing and summarizing those distributions and, in turn, for creating scales from them. 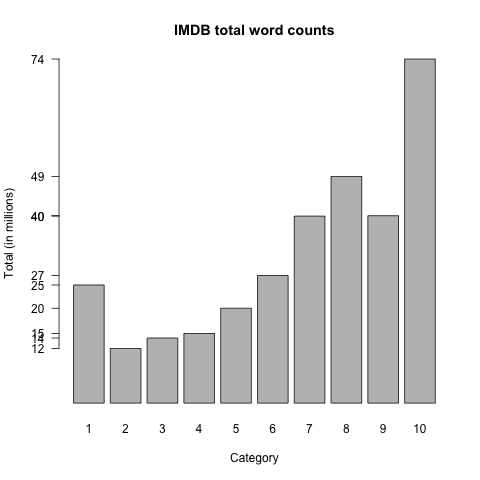 The file imdb-words.csv consists of data gathered from the user-supplied reviews at the IMDB. I suggest that you take a moment right now to browse around the site a bit to get a feel for the nature of the reviews — their style, tone, and so forth. The focus of this section is the relationship between the review authors' language and the star ratings they choose to assign, from the range 1-10 stars (with the exception of This is Spinal Tap, which goes to 11). Intuitively, the idea is that the author's chosen star rating affects, and is affected by, the text she produces. The star rating is a particular kind of high-level summary of the evaluative aspects of the review text, and thus we can use that high-level summary to get a grip on what's happening linguistically. The star rating is primarily an indicator of the speaker/author vantage point. However, there is good reason to believe that readers/hearers are able to accurately recover the chosen star rating based on their reading of the text. Potts (2011) reports on an experiment conducted with Amazon's Mechanical Turk (Snow et al. (2008), Munro et al. (2011)) in which subjects were presented with 130-character reviews from OpenTable.com and asked to guess which rating the author of the text assigned (1-5 stars). Figure MTURK summarizes the results: the author's actual rating is on the x-axis, and the participants' guesses on the y-axis. The responses have been jittered around so that they don't lie atop each other. The plot also includes median responses (the black horizontal lines) and boxes surrounding 50% of the responses. 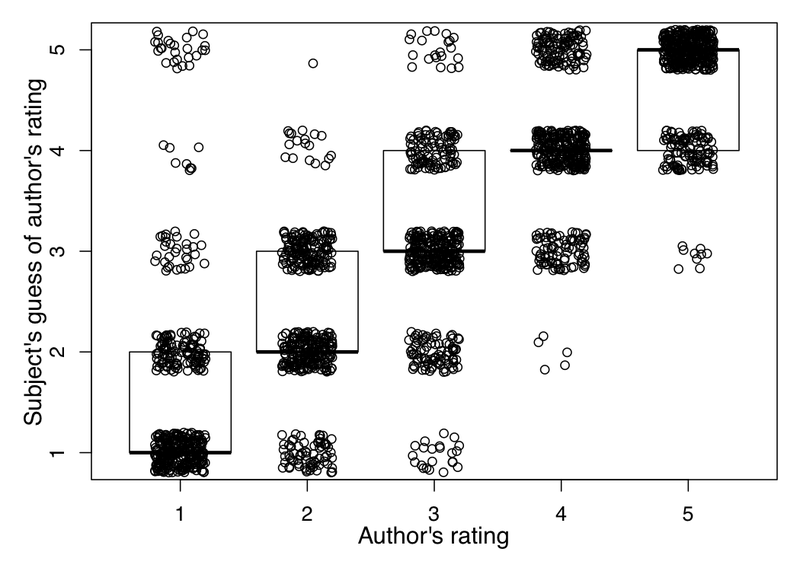 The figure reveals that participants were able to guess with high accuracy which rating the author assigned; the median value is always the actual value, with nearly all subjects guessing within one star rating. Experimental results suggesting that texts reliably convey to readers which star rating the author assigned. The texts were tagged using the Stanford Log-Linear Part-Of-Speech Tagger. The tags were then collapsed into the WordNet tags: a, n, v, r (adverb). Words whose tags were not part of those supercategories were filtered off. This smaller list of words was then stemmed using the high-precision WordNet tagger (accessible from the NLTK's ntk.stem.wordnet.WordNetLemmatizer class). This stemmer basically just removes inflectional morphology. For example, whereas (helps, v) and (helped, v) collapse to (help, v), (helpless, a) is left untouched. In addition, this stemmer always returns lexical items, unlike, for example, the Porter stemmer, which is very aggressive and often returns approximations of bound morphemes. Count: the total number of tokens of (Word,Tag) in Category. Since the file is in CSV (spreadsheet, tabular) format, it can be worked with using a variety of tools. This page uses R, for reasons discussed in the course overview. The highly imbalanced category sizes. ## nrow() returns the number of rows for its data.frame argument. ## xtabs creates contingency tables. Here we sum Count values by Category. 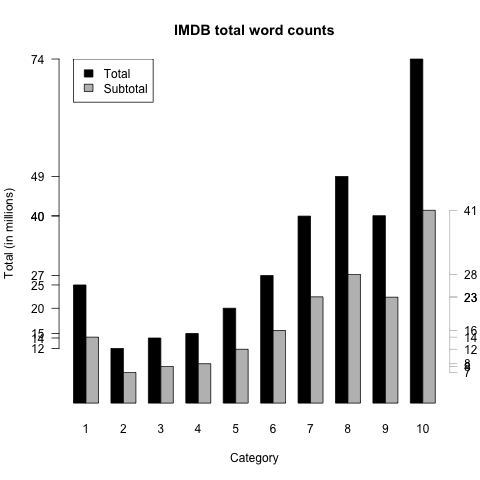 The Total category sizes (repeated from figure TOTALS) alongside the sizes for the subset in imdb-words.csv. The overall distributions have the same shape. Thus, we could work with either set of values, I'd say. Our sample seems to be unbiased with regard to the nature of the categories. (This is not a foregone conclusion; we might have accidentially filtered off more 1-star words than 10-star ones, for example. It looks like this didn't happen, though.) I work with the Total values from here on out, for conceptual simplicity. Count distribution for (bad, a) (left) and the overall category size (right; repeated from figure TOTALS). The distribution is heavly influenced by the category sizes. The source of this odd picture is clear: the 10-star category is 7 times bigger than the 1-star category, so the absolute counts do not necessarily reflect the rate of usage. ## want to do a lot, with Tufte-inspired axis labels. ## Add the column of relative frequency values to the bad subframe. 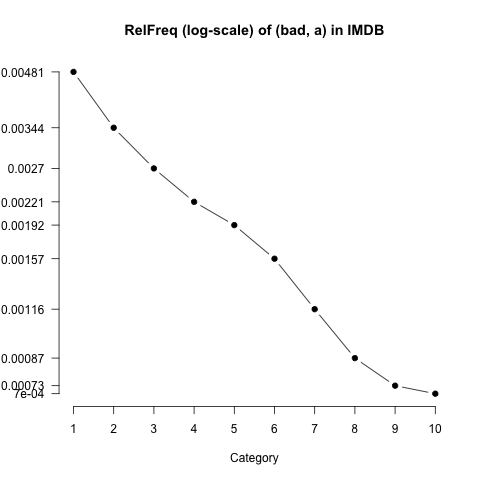 RelFreq distribution for (bad, a) (left), alongside the Count distribution (right; repeated from figure COUNTS). 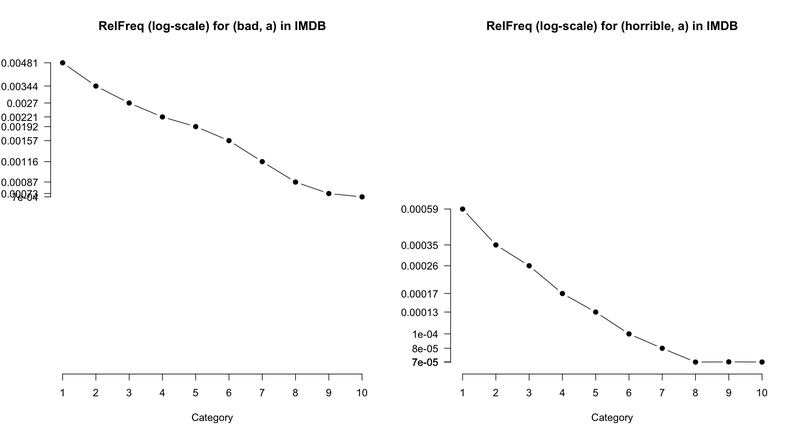 RelFreq values show little or no influence from the underlying category sizes. Comparing words via their RelFreq distributions. It is, I think, possible to discern that (bad, a) is less extreme in its negativity than (horrible, a). However, the effect looks subtle. The next measure we look at abstracts away from overall frequency, which facilitates this kind of direct comparison. Comparing Pr values (left) with RelFreq values (right; repeated from figure RELFREQ). The shapes are exactly the same (Pr is a rescaling of RelFreq). A technical note: The move from RelFreq to Pr actually involves an application of Bayes Rule. 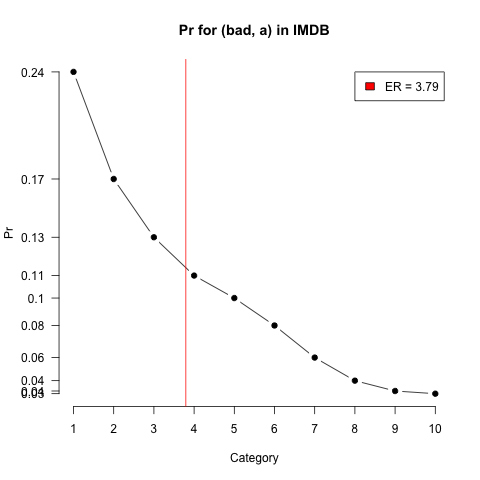 RelFreq values can be thought of as estimates of the conditional distribution P(word|rating): given that I am in rating category rating, how likely am I to produce word? However, we would not want to directly apply this rule, because of the term P(rating) in the numerator. That would naturally be approximated by the distribution given by Total, as in figure TOTALS, which would simply re-introduce all of those unwanted biases. Comparing the Pr distributions of (bad, a) and (horrible, a). The comparision is easier than it was with RelFreq values (figure RELFREQ). 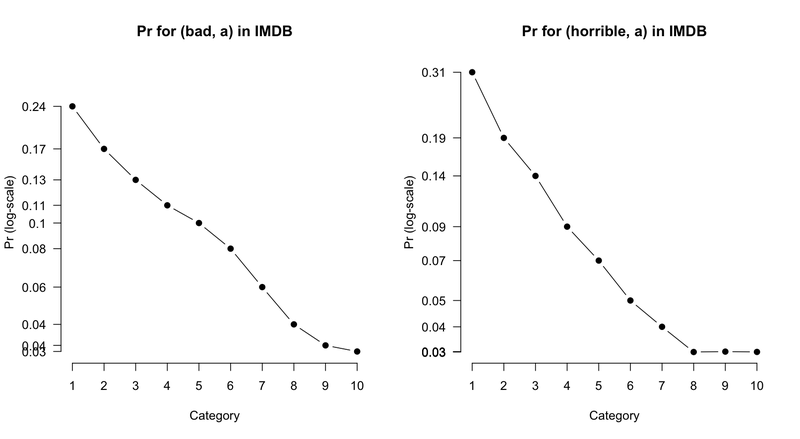 I think these plots clearly convey that (bad, a) is less intensely negative than (horrible, a). For example, whereas (bad, a) is at least used throughout the scale, even at the top, (horrible, a) is effectively never used at the top of the scale. ## Get the subframe for a word and add RelFreq and Pr values. ## Value: the word frame with new distribution values. This section develops two methods for studying the distributions more closely, moving beyond impressions based on plots to get at some more objective measures of what the distributions are like and how confident we can be that they meaningfully reflect usage patterns (as opposed to being just quirks traceable to low overall frequency, quirks in the data, etc.). Expected ratings calculations are used by de Marneffe et al. 2010 to summarize Pr-based distributions. The expected rating calculation is just a weighted average of Pr values. ## The first two arguments to legend are x,y coordinates for placement. ## The third is the text itself. 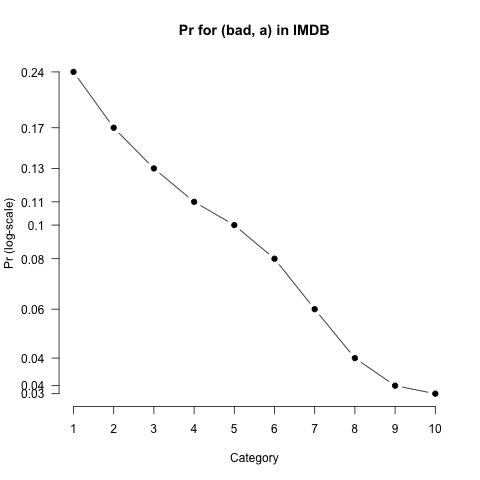 The (bad, a) Pr plot with added expected rating. ## Expected ratings for words. Expected ratings are easy to calculate and quite intuitive, but it is hard to know how confident we can be in them, because they are insensitive to the amount and kind of data that went into them. Suppose the ER for words v and w are both 10, but we have 500 tokens of v and just 10 tokens of w. This suggests that we can have a high degree of confidence in our ER for v, but not for w. However, ER values don't encode this uncertainty, nor is there an obvious way to capture it. Here, we use R's glm (generalized linear model) function to predict log-odds values based on Category. 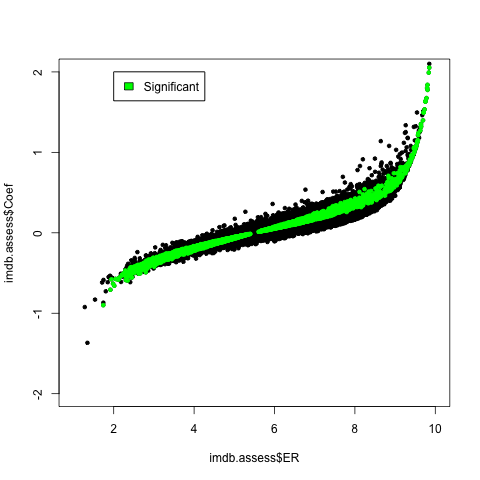 The expression cbind(bad$Count, bad$Total-bad$Count) is used internally by glm to derive the log-odds distribution. Category is our usual vector star ratings. Log-odds distribution with associated model fit. It also helps intuitions to calculate some sample values and compare them to the empirical log-odds that we added to the frame. 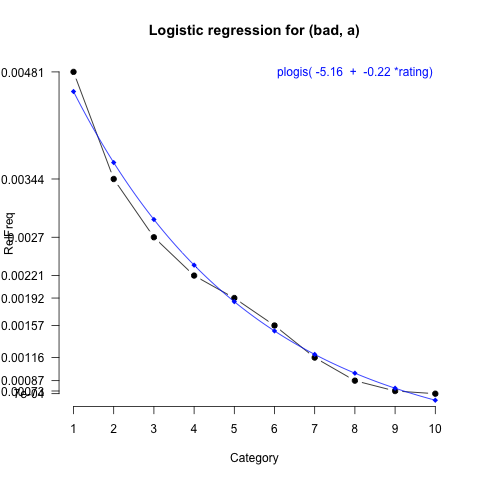 RelFreq view of (bad, a) with logistic regression. ## Prevent R from printing '0' for a p value, which is impossible. ## Input: a model fit produced by WordLogit. ## Output: a string representing the p value as an equality or inequality (if it is tiny). ## Fit a model for a word's frame. ## Interpolate a curve through the fitted values. Comparing words using our assessment values. ## This subfunction calculates assesment values for a word based on a subframe. ## Argument: A Word's subframe directly from the main CSV source file. ## Value: a vector (er, coef, coef.p). ## Load the library for the ddply function. ## then applying WordAssess to those subframes. ## It will also display a textual progress bar. ## Add intuitive column names. ## Outliers make the full plot hard to read. The significant subset seems of most interest, since we can count on its estimates more. A first thing to notice about it is that its distribution relative to categories is different from that of the larger population, presumably because some categories are more scalar, in the requisite sense, than others. ## Add a little extra space to the right to accommodate labels there. 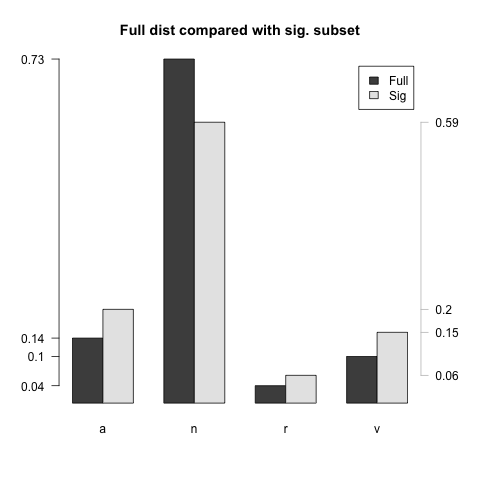 Distribution of tags in the significant subset and in the full vocabulary. These lists look pretty good. There is some influence of the underlying domain, but that could perhaps be weeded out via other resources. See the exercises for more on that. Read it in and then: (i) create a barplot of the review sizes, (ii) create a percentage-wise barplot that gives the review counts and the word counts side-by-side, and (iii) plot the average word counts relative to the categories. For each plot, give the commands you used as well as a few sentences summarizing what useful conclusions we might draw from the plots (things we might keep in mind when doing analysis. DISPLAY Explore a few other words using WordDisplay, to get a feel for what the data are like. Then pick a handful of words and state your expectations for what their profiles should be like and how they should compare. Then issue the command par(mfrow=c(1,wc)) where wc is the number of words to compare, following by WordDisplay commands for each of the words. To what extent are your expectations born out? 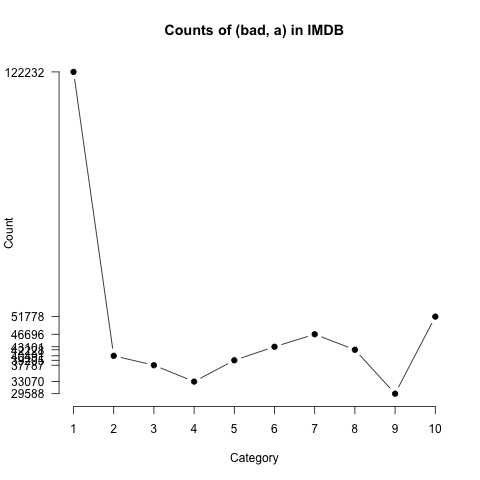 SALT The files imdb-unigrams.csv and fivestarreviews-unigrams.csv in the archive potts-salt20-data-and-code.zip have the same basic structure as imdb-words.csv except that they lack tag information. (They are much bigger, though.) Adjust the plotting and analysis functions given above so that the Tag argument is optional and, if not given, ignored. Then perhaps try out some analysis with these larger data sets. IQAP (This problem pairs well with the corresponding one for WordNet.) Recall that the iqap.Item methods question_contrast_pred_trees() and answer_contrast_pred_trees() extract the subtrees rooted at -CONTRAST nodes from the questions and answers. If we are going to use the review data to compare these trees, then we should first get a sense for how well they cover the IQAP data. As a first step towards doing this, the following code loops through the development set of the IQAP corpus, pulling just the items that have a single '-CONTRAST' word in both the question and the answer. Finish this code so that it provides an assessment of the coverage. (word, tag) pairs to dictionaries of values. # keyword argument p to control whether two words are really related. SENTI This exercise from the WordNet section maps the SentiWordNet scores to a CSV file. Compare those scores with those of imdb-assess.csv (ER values or Coef values, with or without using the p-value as a threshold.). How do the two resources compare? Do they seem to provide conflicting, complementary, and/or correlated information? Which seems more useful and/or more accurate? WORDCMP Figure BHPR informally compares (bad, a) and (horrible, a). The visual impression is that (horrible, a) is the more strongly negative of the pair: it is used hardly at all in the most positive categories, and then begins a very steep rise to 1 star. The trend for (bad, a) is similar, but its inverse correlation with the ratings is more moderate. We would like to make these comparisons more rigorous, with a defined method and some assessment of confidence in the contrasts we think we've found. Intuitively, we would like to compare the logistic regression fits to see whether their coefficients for rating are significantly different. Propose a method for doing that and illustrate how it works for (bad, a) and (horrible, a). Davis (2011: 222ff) develops a technique for comparing whether one logistic regression fit is reliably different form another. I illustrate his technique by way of (bad, a) and (horrible, a). Category:strongerTRUE -0.050527 0.027014 -1.87 0.0798 . The interaction term Category:strongerTRUE says that strongerTRUE correlates negatively with Category (rating). That is, where the word is (horrible, a), we have an increase in the inverse correlation seen in the negative value for the Category coefficient. The negative coefficient for strongerTRUE just reflects the fact that (bad, a) is much more frequent than (horrible, a).